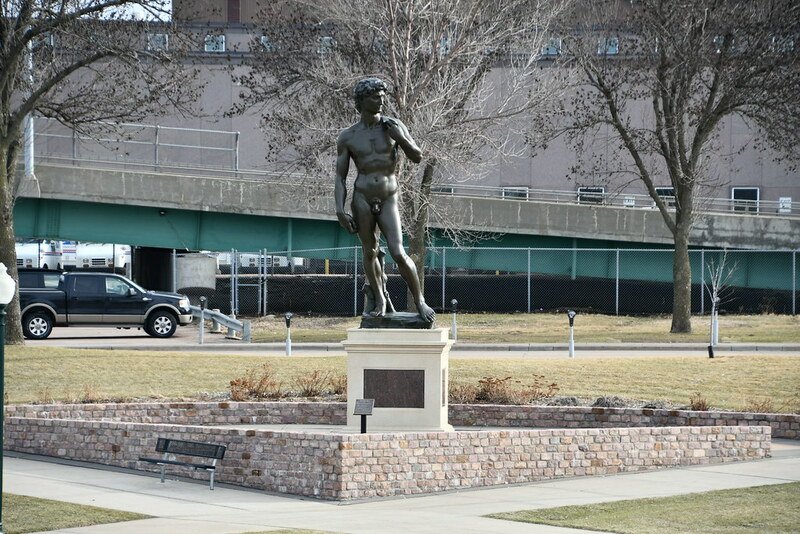 There is a reproduction of Michelangelo's sculpture of David in downtown Sioux Falls. According to the article in the Argus Leader: "Thomas Fawick, born in Sioux Falls in 1889, was an inventor, musician and ultimately wealthy entrepreneur. Fawick Park, downtown on the west side of the river between 10th and 11th streets, was named for him... Fawick, an admirer of Michelangelo's work, donated the Statue of David to Sioux Falls in the 1970s to acknowledge the support of the community when he was a young inventor. The sculpture, one of only a few full-size copies cast from the original by Michelangelo, was removed from Fawick Park for a time while the city cleaned up the land. It reclined on a flatbed in a city garage for a few years, then was reinstalled in the renewed park."